Whenever Ramadan falls in summer, the streets of Mohammed Ali road in Mumbai glitters with light and charm everywhere. Each and every lane of the street is lined up with wide variety of food stalls. And this chilled earthen clay pots of aam ki phirni along with classic firni shows up across the streets in nearly every joint. Mango rice pudding is an ideal meal for not only of iftar but also suhoor. Aam ki phirni a perfect iftar recipe during the holy month of Ramadan. 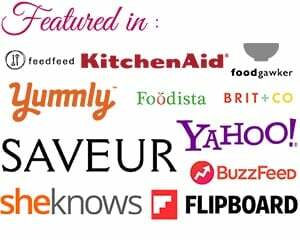 Can we use canned mango pulp for aam ki phirni recipe? 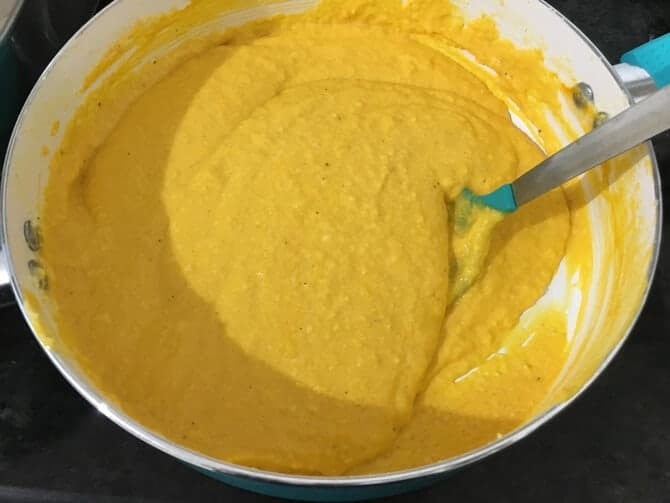 Now, talking about the quality of mangoes we will use for this recipe, please be sure to select firm, sweet ripe mango to make aam ki phirni recipe. 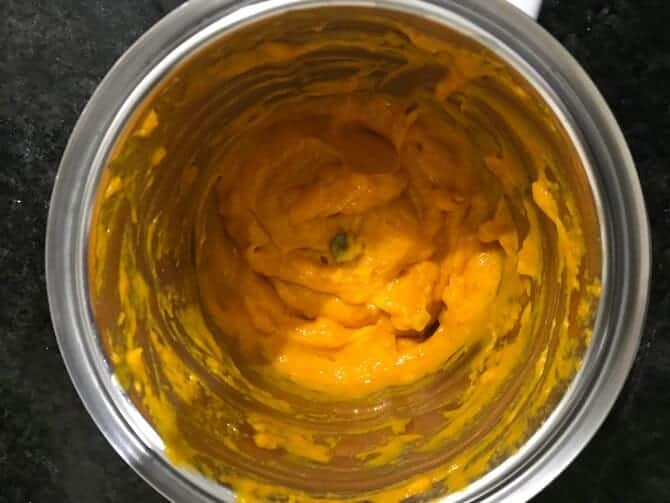 If in case, mangoes are not available in your region, you can make it using canned mango pulp also. Just that, do not forget to keep a check on sugar, as you may have to adjust the quantity of it accordingly. For this aam ki phirni recipe, I have used Alphonso mangoes to make the puree. How to make mango phirni using condensed milk? To make phirni using condensed milk, the only thing we need to do here is, just swap the sugar from this recipe with condensed milk. Again, you have to adjust the quantity of condensed milk depending upon the sweetness you prefer. For this recipe, 1/4 cup of condensed milk is just perfect quantity. 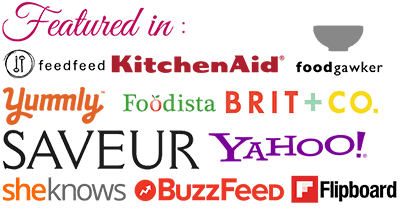 If you see, in the recipe, I have added little khova to it. The addition of khova is absolutely optional. Without mawa also, mango phirni will taste equally delicious as that of with mawa in it. Easy Mango Phirni Recipe - is a delicious creamy summer dessert recipe of Indian rice pudding flavoured with mango puree, cardamom and dryfruits. Here is how to make mango phirni step by step. 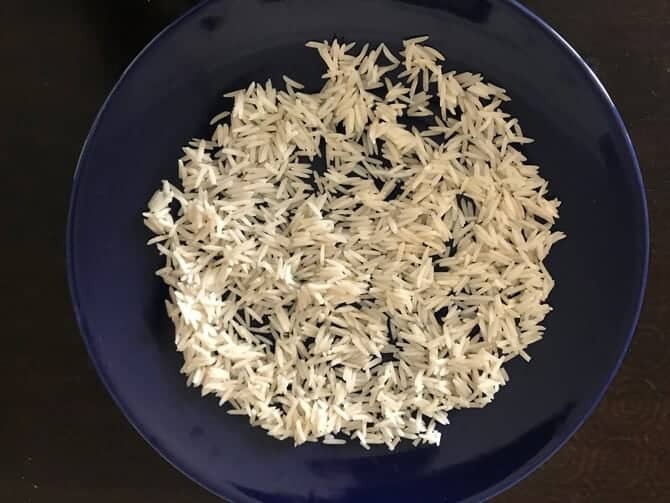 Wash and soak rice for 45 minutes. Drain the water completely and spread it onto a plate to dry well. Now, in a heavy bottom pan, bring the milk to boil. Once the milk starts boiling, simmer it till the milk reduces to 3/4th of its volume. Meanwhile, wash and peel the mangoes and cut it in to cubes. Add the cubes into a blender or mixer. Blend it to a fine pulp. Now, add coarse ground rice stirring continuosly to avoid the lump formation. Then, add cardamom powder and allow it to simmer for 10 minutes. you will see that phirni will start thickening. Keep stirring in between to avoid burning. 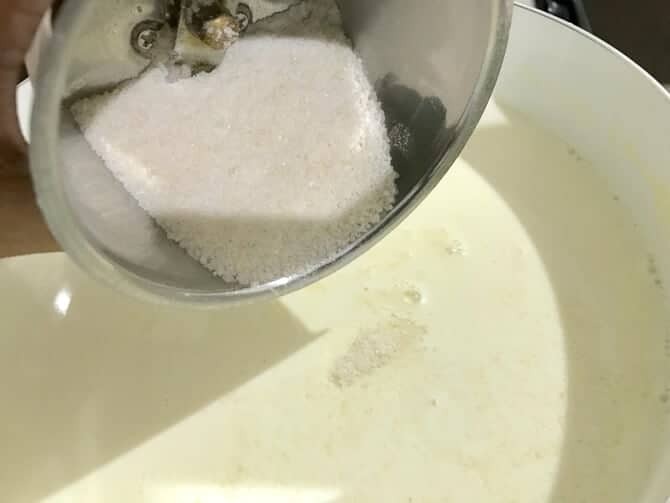 Now, add sugar and khowa, mix well. Now, add mango pulp and mix well. Mango Phirni is ready to dish out. 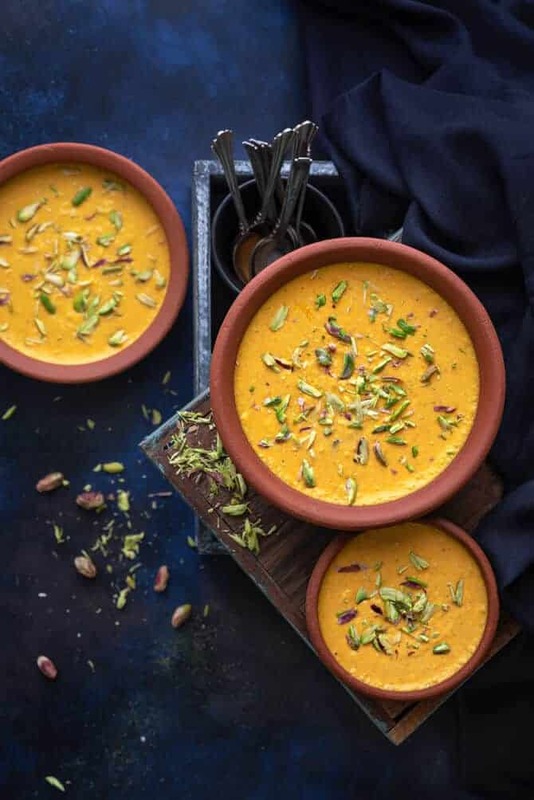 Scoop the mango phirni into earthen clay pots or regular serving bowls and garnish it with almonds and pistachios. Chill for few hours before serving. 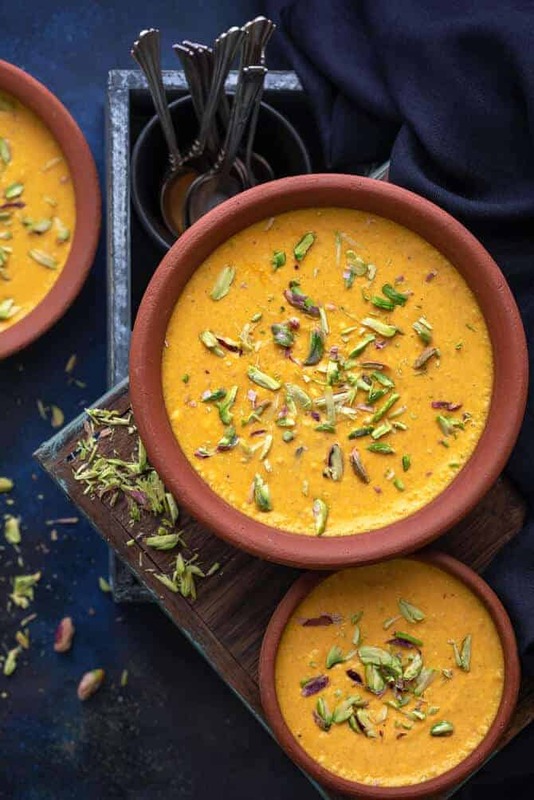 Add mango puree only after the phirni cools completely at room temperature. If you don’t get earthen clay pots, you can also use serving bowls instead. 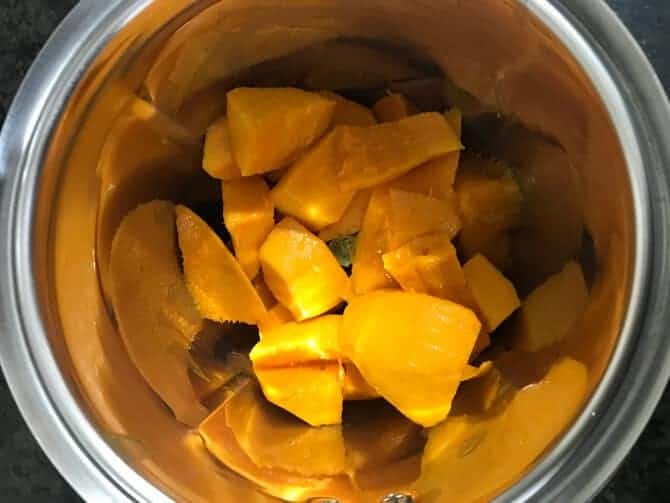 Instead of fresh mango pulp, you can use canned pulp also. You may have to adjust the amount of sugar accordingly as the canned pulp may be already sweetened. 2. Drain the water completely and spread it onto a plate to dry well. 3. 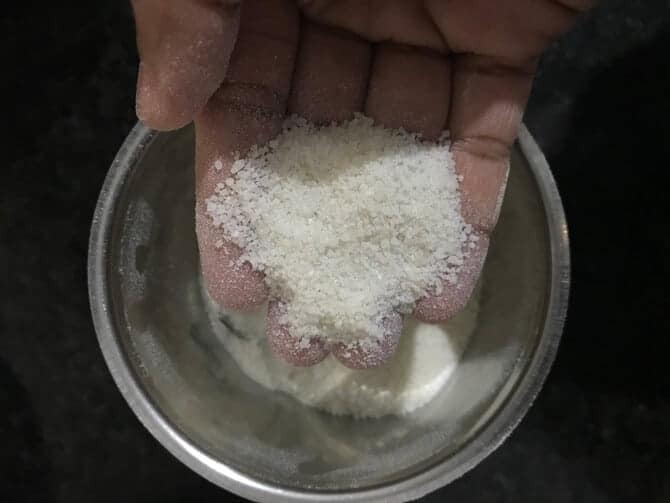 Then, grind it in a mixer to a coarse powder. 4. Now, in a heavy bottom pan, add milk and bring it to a boil. 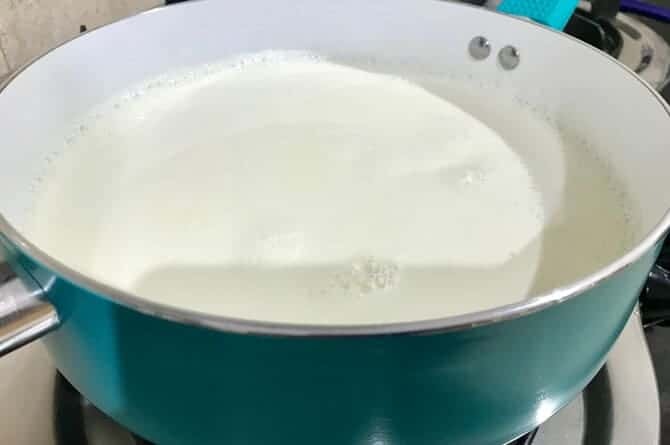 Once the milk starts boiling, simmer it till the milk reduces to 3/4th of its volume. 6. 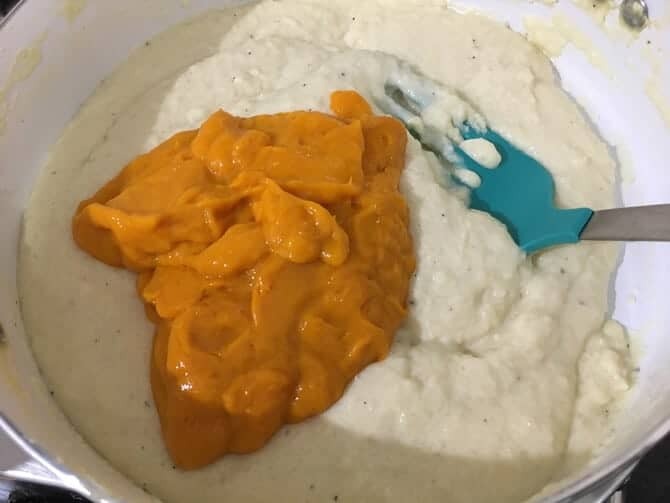 Blend it to a fine pulp. 7. 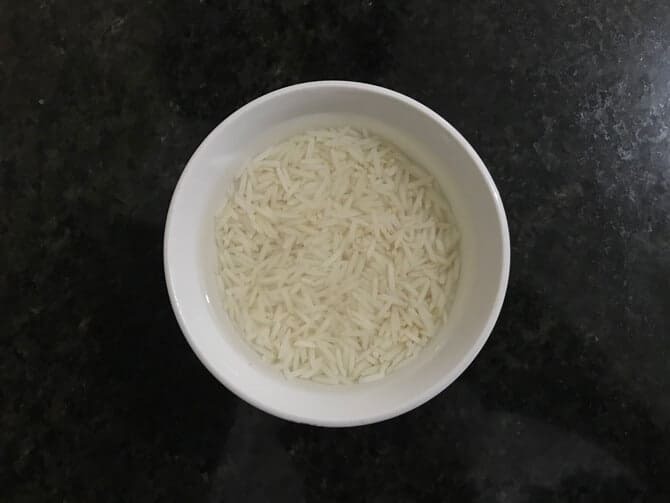 Now, add the ground rice and stir continuosly to avoid the lump formation. 8. Then, add cardamom powder and allow it to simmer for 10 minutes or until the milk thickens. Keep stirring in between to avoid burning. 9. Now, add sugar and khowa, mix well. 10. 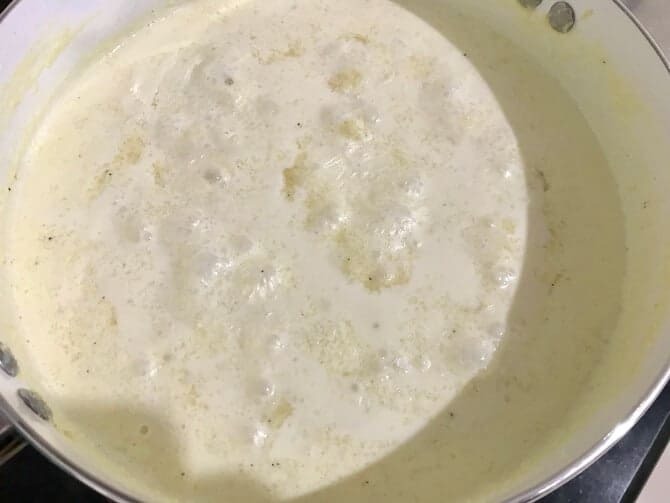 Allow the phirni to simmer until reaches thick consistancy. 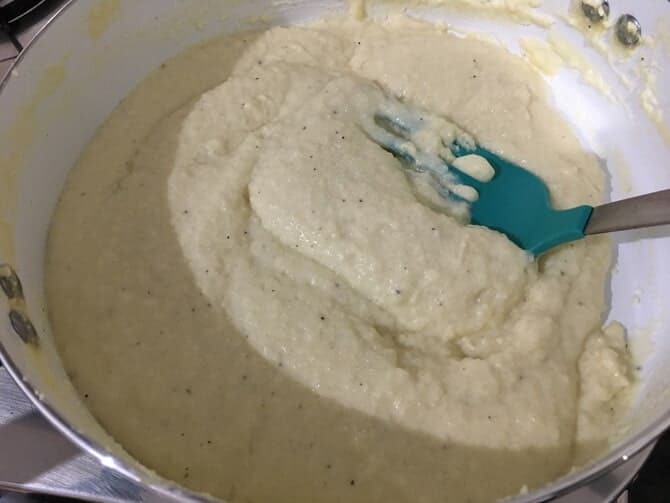 Please remember that phirni will thicken more once cooled. 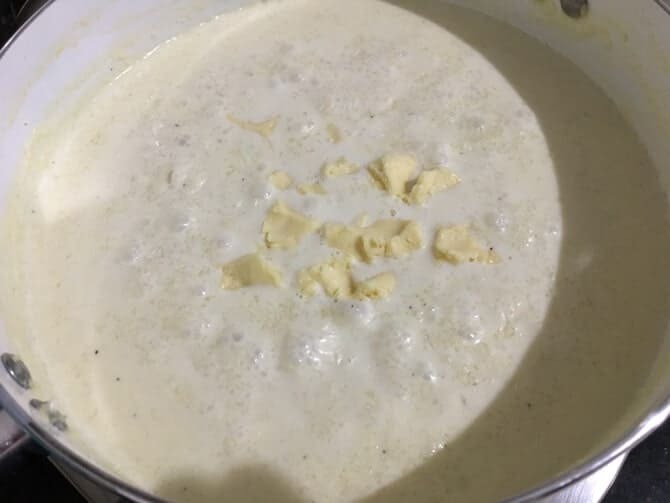 Take the phirni off the heat and allow it to cool completely. 11. Now, add mango pulp and mix well. 12. Mango Phirni is ready to dish out. Scoop the mango rice pudding into earthen pots ot serving bowls and garnish it with sliced pistachios and almonds. Chill for few hours before serving. Serve chilled. Wonderful recipe and great pictures. I made it today and everyone loved it.